This recipe appears to have been carefully cut out of a magazine because it has graphics on the backside. However, it is on thick paper similar to what would be used for product packaging. Since this recipe calls for a specific brand name of baking powder, it was probably on the package of baking powder. 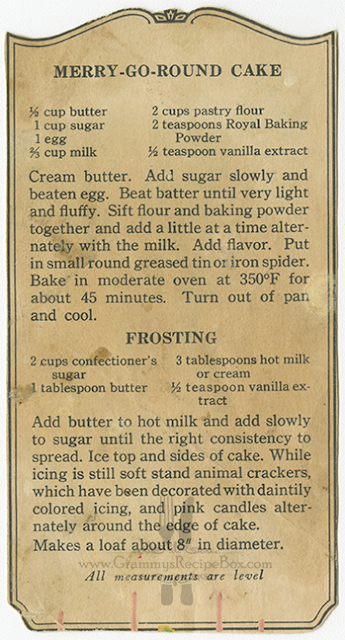 There are a few hints that indicate this recipe is probably pre-1940s: 1) the paper is aged; 2) it calls for butter (most post-WWII recipes I've found used margarine instead of butter); and 3) the described baking pan is a "tin" or "iron spider" which seem like older terms. I looked up what an "iron spider" is and found that it is a cast iron skillet (I saw some with raised legs).